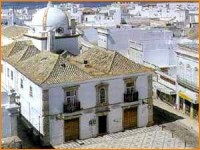 The town of Olhão is essentially and historically linked to the local fishing industry and only grew into existence as a significant location in the 17th Century. It has about 30,000 inhabitants and was raised to the status of a town in 1808 on the 16th of June when they revolted against the French occupying army. Then 17 local fishermen successfully crossed the Atlantic Ocean without charts in their small fishing boat “Bom Sucesso”. Their purpose was to announce to the exiled King of Portugal, Dom João IV, that the French invading armies had been defeated and had returned to France leaving Portugal free for their King to return. It was in this town in 1882 that the first canning factory for tuna and sardines was established. 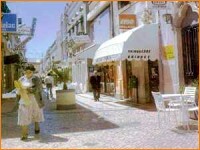 Very soon canning factories spread along the coast and it became the leading industry of the Algarve. 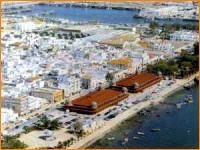 Architecturally the town is well known for an older quarter where the flat terraced roofs and straight box-shaped chimneys show a definite Moorish flavour. Another curiosity is the fish market in a long building on the waterfront. Every morning there is a lively atmosphere and the impressively large variety of fish offered by the local catch is displayed to tempt the local housewife. Travelling east from Olhão is the small sea village of Fuseta with the ruins of a castle and the older similar architectural style houses. To the north is the village of Moncarapacho with a 16th Century Church and a small local museum next door. On the nearby hill named Cerro da Cabeça there is a popular grotto named after the village. 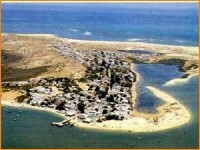 From the town of Olhão there is a ferry service that takes visitors to the nearby small islands of Ilha da Culatra and Ilha da Armona. With their un-spoilt sandy beaches and lack of construction these islands act as a pleasant contrast to the noise and bustle of the neighbouring town.